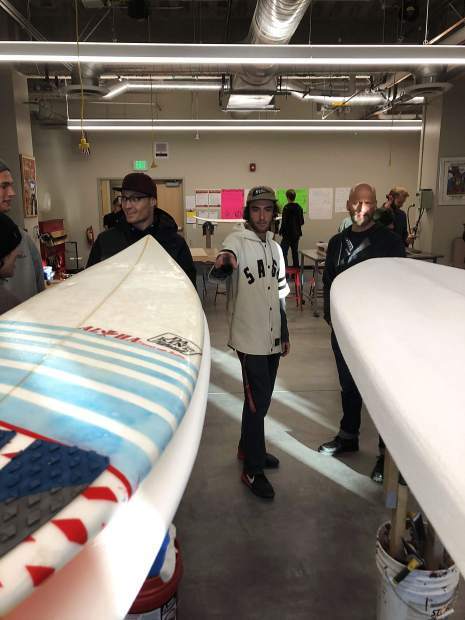 Through the new Gone Boarding program at Truckee High School students will get the chance to design and contruct their own skateboards, sufboards, snowboards and stand up paddle boards. Truckee High School’s push to provide a more hands-on, career-based curriculum continued this year with the implementation of the nationwide Gone Boarding program, a design workshop that allows students to create an array of different boards. Similar to a traditional woodworking class students are taught how to design, shape and fabricate skateboards, snowboards, surfboards and standup paddle boards. “This is a class that makes students want to come to school,” said Truckee High School Principal Logan Mallonee. “They’re more successful in core classes because they show up because they’re excited about Gone Boarding,” she said, adding that students have to use components of their core classes to design these boards. The program was established at the high school following the renovation of the school’s west wing in which the original woodshop was lost. That’s when Mallonee began searching for an alternative class that could fill the new fabrication lab. After a Google search she discovered the Gone Boarding Program that had been implemented in at least 10 schools around the country. She said she felt the program would be harmonious with the environment and culture of Truckee. Working with partners including Burton and Vans, the program introduces students to the board making process as well as the marketing aspect of the business. “Maybe they want to be an entrepreneur, maybe they want to go into marketing,” said Mallonee. Once the program gets off the ground, she said the students may be able to sell their creations to a local board shop with their own logos. “There’s so many facets of these jobs that students can possibly be ready for in the future,” she said. The program coincides with the school’s decade-long implementation of Career Technical Pathways, a structure of teaching which not only prepares students for skilled trade jobs but can lead to higher paying jobs and better opportunities for a higher education out of high school. It places students in career specific classes that provide professional experiences in the Truckee community. It began with a food service and hospitality pathway and has now culminated into a variety of programs including biotechnology and engineering. “It’s a culmination of everything we’ve been working hard to create at Truckee High,” said Mallonee. “The design process is what we use in all of our pathway processes,” said Mallonee. “They have to make sure the design is solid before going into the build process.” She said that every student in the class will make a long board skateboard on their own, followed by a bigger project, a surfboard, wake surf board or a standup paddle board, that they construct with two other students. Currently the class has 25 students enrolled and plans to enroll 25 more students next semester. In addition the high school will be introducing the program at the elementary level starting with a one-day workshop for 60 elementary students on Dec. 12.